The ‘local coffee shop with a soul’ is how they like to be known since opening five years ago and owner Ivana Kovarikova says she and her team pride themselves on having a vibrant, welcoming vibe. 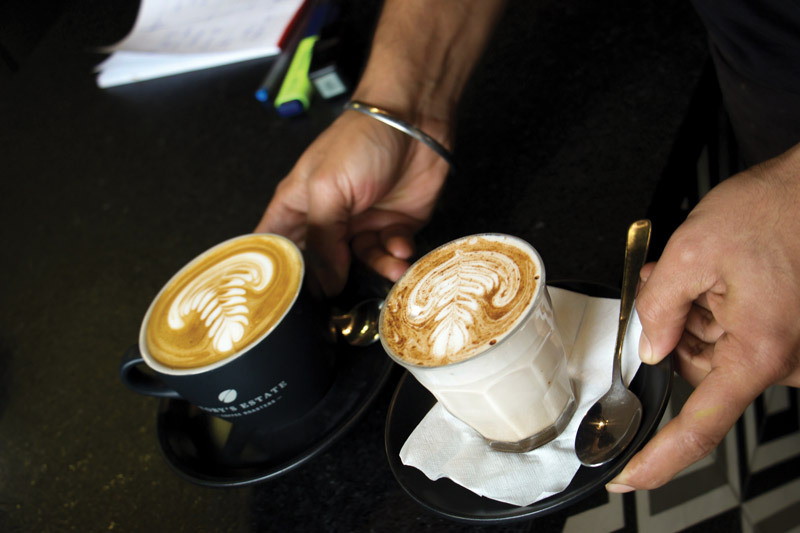 She says the Toby’s Estate Broadway blend they serve has been instrumental in establishing the café’s reputation as a venue of choice in Dee Why. Specialty coffee is a rotation of seasonal single origins and they make Chemex filtered coffee to order. Oliver’s Twist Espresso won the ‘Best Coffee’ category in the COVERED. Coffee Championship in 2016 and is hoping for similar success this year. The café is part of the ‘HEY YOU’ app so customers can order from their phones and just call in and collect. Their deck and beautiful sunny outdoor area plus the great central location, right next to the almost completed Meriton development and minutes from shops, restaurants and transport links, makes Oliver’s Twist ideal for a breakfast, morning coffee or evening dinner at the weekend. Ivana says she has a great team including chef and hospitality professional Anna Borna Kennedy, who is adding extra inspiration to the dishes and has been assisting in developing the new wine bar menus and events. She says credit for the café’s success must also go to hard-working manager Navdeep Singh, who has been part of the team since the café opened. Surrounded by major construction works for the past two years, Oliver’s Twist is now embarking on a new phase with evening openings on Fridays and Saturdays and the launch of spring and summer menus. The evening menus include dishes like Baked Halloumi or Camembert, Chunky Guacamole, Antipasto Board and Chicken Taco to be enjoyed with wine, beers or an array of cocktails. There are live music nights and various events planned for the coming months. The daytime menu has favourites like a bacon and egg roll, fruit toast and bircher muesli, a sausage taco, signature dish - roasted flat mushrooms on a sourdough with grilled halloumi, rocket, poached egg, tahini dressing and pepitas, and delicious Toby’s Estate coffee. Oliver’s Twist supports local produce, welcomes Keep Cups and is reducing its bottled beverages. They serve PUREZZA premium still and sparkling water which is also the base for their home-made sodas. Ivana opened Oliver’s Twist with her husband Oliver Kovarik after successfully building up Bacino Bar at Dee Why Beach which the couple opened in 2007. She says that with more than 20 year’s experience in hospitality, they both worked hard on creating a distinctive venue. Since the couple separated, Ivana is now sole owner of Oliver’s Twist. She says the café is a great venue for birthday parties, functions and celebrations, as they can cater for up to 50 people with delicious finger foods or a buffet style menu and are fully licensed.